Does your next event have a fantastic guest speaker attending that could benefit from a lectern on stage? Whatever stage look you are going for we can provide you with a truss lectern which we can even dress to match your event. We have a range available for hire including a variety of stages. If you are looking to hire a lectern for your upcoming event, or if you have any other questions about our stock, please contact us and we will be more than happy to help. 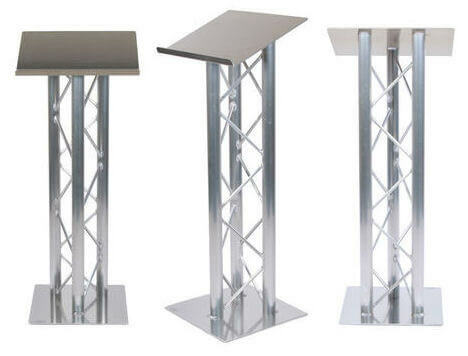 We supply lecterns for use in your conference or a/v presentations. Combine these with a Speaker package, screens & projectors and wireless microphones for a package deal.